Hey ladies, how’s your week going? Things have been movin’ & shakin’ in our world…now that I’ve got a pretty (…and clean!) workspace, I have been feeling even more motivated to wake up early and take on the day…it’s the best feeling and has definitely given me a nice boost in my productivity! Thus, it’s 7am and I felt compelled to wake up with the sunrise and get this post up for y’all! …Not to mention, coffee was calling my name as I lay in bed, ha! This striped sweater is by Free People and I’m wearing size XS for reference. I love the fun mix of textures and colors, they pair so well and are very flattering. It’s a great staple piece to wear with jeans, or you can play it up and style it with a denim skirt and some darling little ankle strap heels (…as seen in this Instagram post). I love the idea of layering sweaters (seriously makes for THE coziest outfit ever! ), so I wore my trusty chunky knit cardigan (in the oatmeal color, size XS), also by Free People. (…I know, I am literally obsessed with so many of their pieces this season!!). The length is perfect and I love the exposed button details – I get compliments on this thing every time I wear it, highly recommend! Ps. 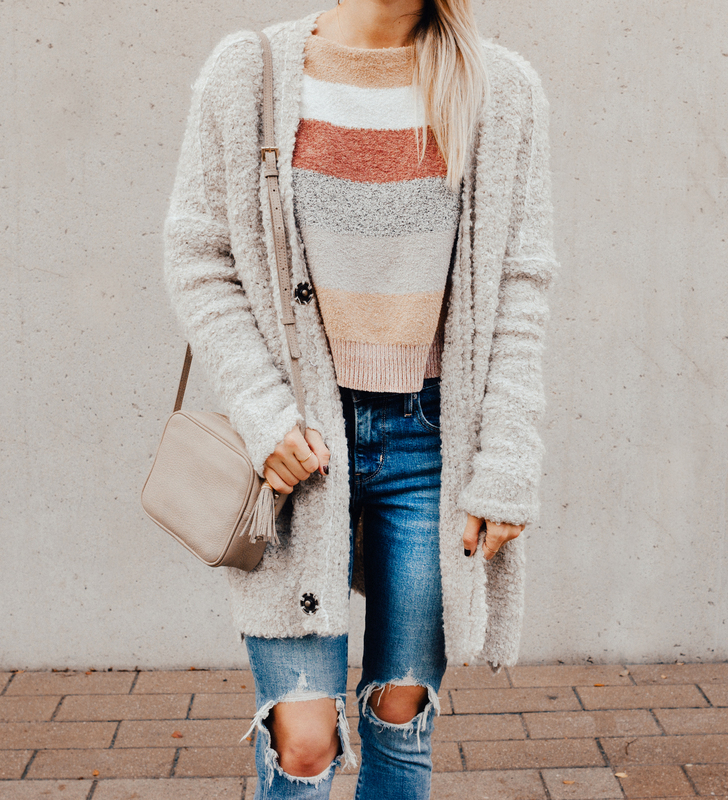 If you get itchy from wool in your clothing, I recommend getting this cardigan instead – it still has that equally cozy + effortlessly oversize look to it, but without the itch! My jeans are Levi’s and they are phenomenal…hence why I wear them in so many posts these days. Just $88 and hit right above your hips, making them so comfy to wear while you eat (#priorities, obvs) but also reaaaally cute with a belt and a tucked in tee or sweater. They fit TTS for reference. 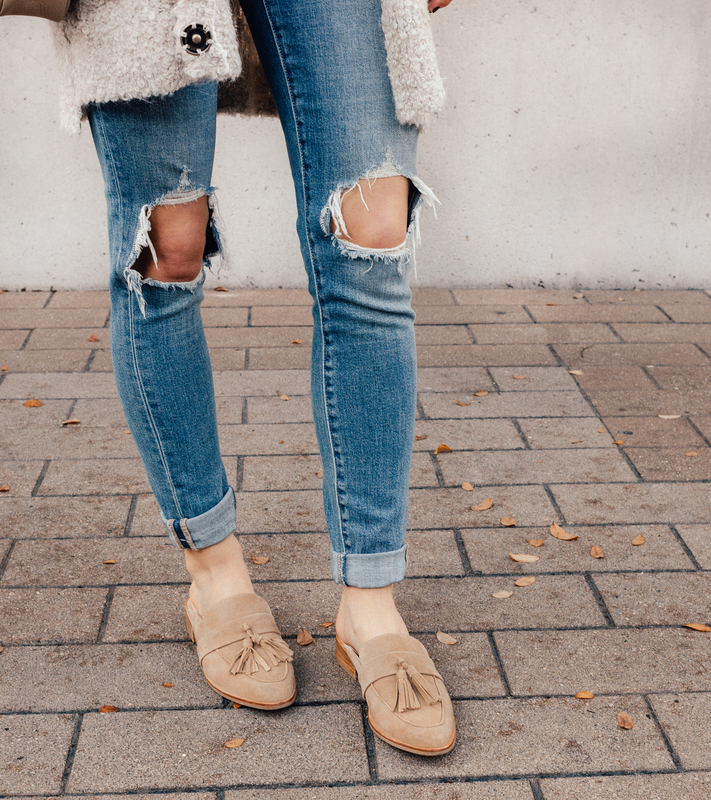 Lastly, my new tassel slides are by Steve Madden and I have worn them as much as I wear these jeans…which is a LOT! I am in love with the color (it goes with everything) and they add a smart, elevated touch to any outfit. Super comfy and also come in black and silver, they fit TTS. does these jeans fit true to size? 🙂 they look awesome!